Tens of thousands people across the world are currently celebrating the Chinese new year as they welcome in the “Year of the Dragon” and Club 3D adds another bang with the introduction of the all brand new Club 3D Radeon HD 7950, followed by the earlier introduction of the Award Winning Radeon HD 7970, the world first 28nm GPU. With 1792 stream processors, a 384 bit GDDR5 memory bus that provides 3.15 TFLOPs of computing performance, the Club 3D Radeon HD 7950 graphics cards are intended for gamers who never settle. Equipped with AMD Graphics Core Next Architecture and the latest power management technology, this card takes a no-compromise approach to gaming. EYEFINITY 2.0: Eyefinity 2.0 Technology features all-new support for Stereo 3D, universal bezel compensation and brand new display configurations which allows the user to configure custom resolutions and the ability to relocate the Windows task bar to an arbitrary screen. DIGITAL MULTI-POINT AUDIO (DDMA): The next step in audio output from a graphics card. Traditionally video cards has been able to output audio through the HDMI port and audio has been restricted to to a single device, be it a monitor, HDTV or a receiver. With DDMA now you can send audio to multiple devices via the DisplayPort combined with the HDMI. Imagine a video conferencing where each attendee is mapped to a monitor and with DDMA set on each monitor speaker set. Graphics Core Next (GCN) Architecture and AMD App Acceleration: A revolutionary new architecture. Jump right into GPGPU applications today with Microsoft C++ AMP and OpenCL for spectacular performance with the GCN architecture. From video editors to Internet browsers, AMD App Acceleration is a supercharger for everyday applications. 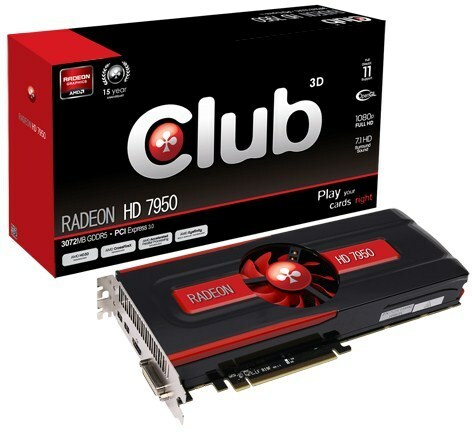 The Club 3D Radeon HD 7950 was engineered for the revolution in GPU compute. ZERO CORE POWER: AMD is introducing with the Southern Islands chipset their long idle power saving technology. Now the graphics card can turn off most of its functional units of the GPU, when they are unused, leaving only the PCI Express bus and other components active. This as a result, reduce the power consumption from 15W at idle to under 3W in long idle, a power level low enough that Zero Core Power shuts off the fan as there is no heat generated further saving energy. ZCP will put CrossFire grapics cards in ZCP when not in use. PCI EXPRESS 3.0: 4 years after the introduction of PCI-E 2.0, the all new PCI-E 3.0 specification is now introduced. Providing 1GB/sec per lane bidirectional, which for a X16 device means 16 GB/sec, doubling 8 GB/sec on the previous generation. FAST HDMI Technology: With the introduction of the HD 6000 Series, HDMI 1.4a implementation allows the graphics card to enable Stereo 3D on HDTVs or monitor displays, this same feature is also found on the new HD 7950. Now with the introduction of HDMI support for 4K x 2K displays, the HD 7950 is now able to run 4K x 2K displays (max resolution 4096×3112) over HDMI along with being able to support 1080p Stereo 3D at 120fps (60Hz/eye), with the current standard set at 48fps (24Hz/eye). Dual BIOS Toggle Switch: The Club 3D Radeon HD 7950 comes with a toggle switch. The graphics card comes standard at 800 MHz GPU clock speed with an overclocking headroom at 900 MHz and beyond.